Get todays MLB odds and lines on this game. O.co Coliseum is the site of the matchup between the Texas Rangers and the Oakland Athletics on Sunday, August 27, 2017. The probable starting pitchers are A.J. Griffin for the Rangers and Jharel Cotton for the Athletics. Texas opens at +100 while Oakland opens at -110. The Rangers have a 56-69-3 over/under record and a 72-56-0 run line mark. The Athletics are 66-62-0 against the run line and have a 67-57-4 over/under record. The Rangers have a 64-64 overall record this season. Starting pitcher A.J. Griffin has a 6-4 record with an earned run average of 5.10 and a WHIP of 1.27. He has 49 strikeouts over his 60 innings pitched and he's given up 55 hits. He allows 8.3 hits per 9 innings and he has a FIP of 5.9. The bullpen has an earned run average of 4.33 and they have given up 400 base hits on the year. Teams are hitting .258 against the bullpen and they've struck out 377 hitters and walked 175 batters. As a team, Texas allows 8.9 hits per nine innings while striking out 7 batters per nine innings. They are 15th in the league in team earned run average at 4.42. The Rangers pitchers collectively have given up 1,111 base hits and 554 earned runs. They have allowed 167 home runs this season, ranking them 11th in the league. Texas as a pitching staff has walked 438 batters and struck out 882. They have walked 3.5 men per 9 innings while striking out 7 per 9. They have a team WHIP of 1.37 and their FIP as a unit is 4.79. As a team Texas is hitting .246, good for 25th in the league. The Rangers hold a .438 team slugging percentage and an on-base percentage of .323, which is good for 17th in baseball. They rank 26th in MLB with 8.2 hits per game. Elvis Andrus is hitting .294 with an on-base percentage of .337. He has 148 hits this season in 504 at bats with 66 runs batted in. He has a slugging percentage of .466 and an OPS+ of 108. Nomar Mazara is hitting .258 this year and he has an on-base percentage of .335. He has totaled 112 hits and he has driven in 83 men in 434 at bats. His OPS+ is 100 while his slugging percentage is at .433. The Rangers have 1,046 hits, including 190 doubles and 200 home runs. Texas has walked 432 times so far this season and they have struck out 1,155 times as a unit. They have left 790 men on base and have a team OPS of .761. They score 5.07 runs per contest and have scored a total of 644 runs this year. Oakland has a 56-72 overall mark this year. With an earned run average of 5.63, Jharel Cotton has a 6-10 record and a 1.47 WHIP. He has 82 strikeouts over the 104 innings he's pitched. He's also given up 108 hits. He allows 9.3 hits per nine innings and his FIP stands at 5.47. The bullpen has an earned run average of 4.66 and they have given up 413 base hits on the year. Teams are hitting .248 against the Athletics bullpen. Their relievers have struck out 419 batters and walked 161 opposing hitters. As a team, Oakland allows 9.1 hits per nine innings while striking out 7.6 batters per nine innings. They are 24th in the league in team earned run average at 4.74. The Athletics pitchers as a team have surrendered 1,135 base knocks and 592 earned runs this season. They have given up 163 home runs this year, which ranks 12th in Major League Baseball. Oakland as a staff has walked 395 hitters and struck out 953 batters. They give up a walk 3.2 times per 9 innings while they strike out 7.6 per 9. Their team WHIP is 1.36 while their FIP as a staff is 4.50. As a team, they are batting .242, good for 28th in the league. The Athletics hold a .426 team slugging percentage and an on-base percentage of .315, which is good for 24th in baseball. They rank 28th in MLB with 8.2 hits per contest. 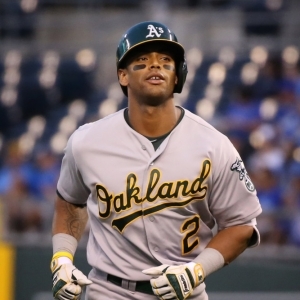 Khris Davis comes into this matchup batting .233 with an OBP of .321. He has 107 hits this year along with 87 RBI in 459 AB's. He maintains a slugging percentage of .510 with an OPS+ of 121. Jed Lowrie is hitting .270 this season and he has an OBP of .343. He has collected 123 hits in 456 at bats while driving in 45 runs. He has an OPS+ of 111 and a slugging percentage of .441. The Athletics as a unit have 1,036 base hits, including 238 doubles and 176 homers. Oakland has walked 441 times this year and they have struck out on 1,183 occasions. They have had 840 men left on base and have an OPS of .741. They have scored 4.39 runs per game and totaled 557 runs this season. Who will win tonight's Rangers/Athletics MLB game against the spread?